Home » agriculture » Dealers Day Event hosted by Mascus and Ritchie Bros.
Mascus, the largest online listing service for used construction and agricultural machinery, and Ritchie Bros., world’s largest auctioneer of heavy equipment and trucks, welcomed interested participants to the second edition of Dealers Day this October, at the Canon Convention Centre in Krefeld. 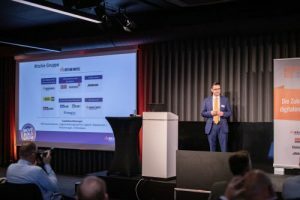 Various valuable speakers shared their views and experiences on the digitization of the heavy equipment industry, the challenges of this new trend and the many opportunities arising from embracing it. 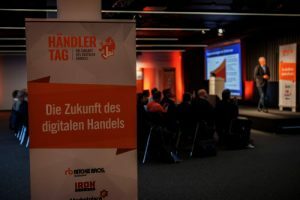 The opening of the event belonged to Holger Schmidt, a digital economist and university professor at Darmstadt Technical University. 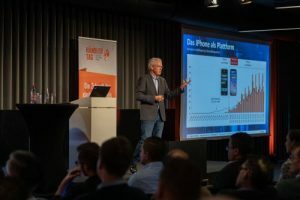 In his presentation, he drew the attendees’ attention to the shift of future-defining innovations from the area of technologically sophisticated products to those specifically designed for online platforms. Seven out of the world’s ten largest companies have already dedicated resources to this. In order to prepare for the future, German companies will have to enlarge their business portfolio and expand their horizons. Amazon, for example, made most of its profits by working with third-party merchants. Cooperation was imperative rather than isolation. Furthermore, it’s easy to notice that after the market penetration of platforms in the consumer sector has been almost completed, the main players are currently beginning to focus on the B2B sector. The likely conclusion is that it will not take much time until this focus lands on the local industry as well. 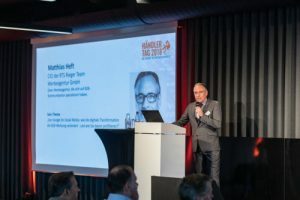 Dirk Windeck, Head of Used Machinery department at Bomag, revealed the challenges the division he is responsible for is facing, from the increase of used machinery stock with demonstration machine models, to the integration of used machinery into the rental fleet. Specifically, the introduction of a second level of quality certification for the machines, which is very demanded on the market and which would bring extensive guarantees, required the collection and management of a high volume of data. That meant not only the collection of data from the workshops in order to assess the warranty but also observing the market prices in order to correctly evaluate the price of a machine. To better utilise this data, they have commissioned the development of a used machine search app, and also launched a Facebook campaign for increasing the market reach. 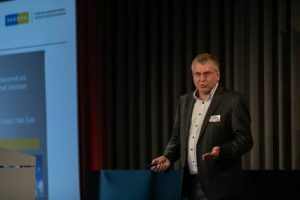 The second speaker at this event, Frank Koslowski, CIO at Swecon, presented some of the biggest advantages that come from digitization. The business model of selling or leasing used equipment can be extended to also providing complete services, as in the case of Swecon. 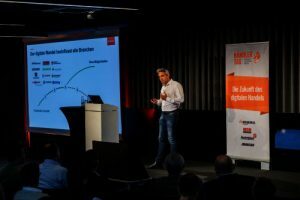 His presentation titled “Bring light into the dark – advantages of data transparency / digitization in the management and sales of machine inventory” revealed Swecon’s successful transition from a reactive to an active method of operating. The introduction of their ERP system, which records machine data such as fuel consumption or error messages, as well as receiving input from the machine manufacturer in the form of software updates or repair instructions, was a key step in the digitization process within his company. At the same time, repair and rental requests from customer portals were easily integrated in their ERP. Furthermore, a proactive maintenance planning and monitoring are possible to achieve, machine operators receive valuable help for an optimal machine use, and it also allows Volvo fitters on site to be assisted by an operator. 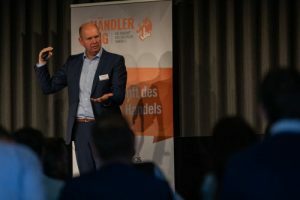 Afterwards, Peter Feldmeier shared a concrete example of how a company can deal with upcoming challenges and how to discover new business possibilities. He is a partner at Etventure, a company which guides established industrial companies in their digital transformation as well as assists new digital businesses start-ups. The example presented was the case of their client Putzmeister, German manufacturer of concrete pumps. After an initial analyse of the company situation, a possible new business area was revealed in offering machine rental services. This materialised fast into “Pumpnow” by following the usual agile methods, underwent a market test and within a few months became an established market presence. 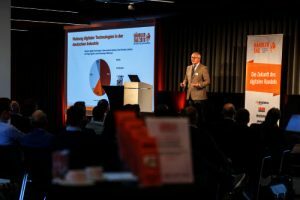 Next on the panel of speakers was Matthias Heft, CDO of the RTS Rieger Team advertising agency. He offered insights into the development of brand identity using platform-based marketing tools and focusing on giving brands their own meaning, which points beyond the products they offer. Aside from the usual methods of addressing consumers, he also advocated the use of platforms such as Xing or LinkedIn for B2B marketing, the possibility of using the WhatsApp Business app, created especially for small businesses, which brings a great benefit in building a customer network. Frank Birzele, Strategic Account Manager at Ritchie Bros. Auctioneers, explained how his company has been expanding in the past few years its main business by adding related digital services such as inspection, handling stock data export / import or providing financing and transport solutions, thus creating a comprehensive portfolio of ancillary services. 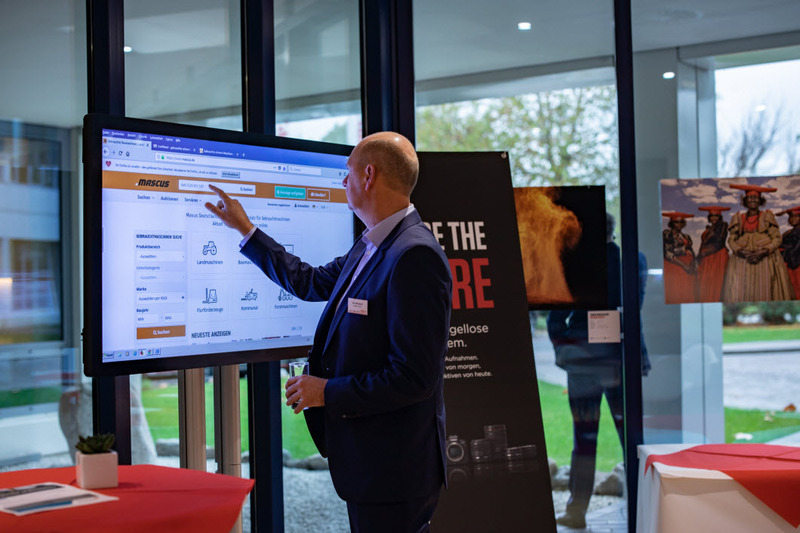 To warp-up the Dealers Day event, Michael Radwe, Mascus Senior Sales Manager for Mascus DACH, presented in detail the many solutions that Mascus can offer to heavy machinery dealers for digitizing their businesses. There are several steps to follow in order to accomplish this. Firstly, the creation of a customised Webshop with the client’s brand design, then the possibility of using an Inspection App, a solution for renting machinery, advertising on Mascus via banners, the creation of an Inventory Management System (ISM) for a company’s used machinery stock, and even a Publisher tool for creating branded brochures and catalogues.